Drawn in April(?) 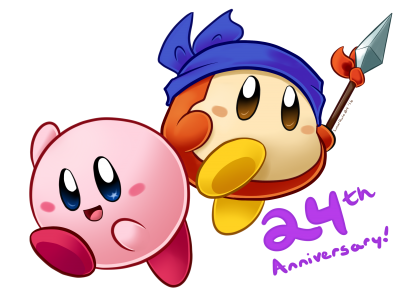 for the Kirby series' 24th anniversary! It's a bit late to be posting it here since, well, it's August. But hey! That reminds me, wasn't Kindar creating an album of kirby art / memories or something in preparation for the 20th Anniversary? I wouldn't know, unfortunately. I wasn't around here back then. Sounds like it would've been cool though!